If I said to you "I was talking to a bloke in the pub..." or "I met this fella in the street..." you'd have no idea whether he was aged 18 or 81 or anywhere in between. But it seems to me that we are missing equivalent female words. Please be sure that this is not some feminist 'men vs women' thing, and neither is it about age; I just think that 'bloke' and fella' are such great non-specific words. I even like the word 'geezer' too, though to certain people that word describes a certain particular type of blokey fella. I have discussed this subject with friends and the best female counterparts we can come up with that have no equal and opposite, as in man/woman, gentleman/lady, boy/girl are [sadly] 'bird' and 'babe', both of which are bound to upset a lot of people. So, until someone can think of a good, inoffensive, ageless word for a female between 18 and 81, here is a collection of birds. Click anywhere on the montage to see it at a bigger size. Row 1: Vulture(?) on a closed down pub, Brook Drive, SE1; T Bird, Blackstock Road, N4; The Eagle, City Road, N1; The Falcon (now Waxy's Little Sister) Wardour/Lisle Street, W1; weathervane, Tanner Street, SE1. Row 2: Truman pub lantern, Coldharbour Lane, SW9; The Swan (no more), Bethnal Green Road, E1; The Old Eagle, Royal College Street, NW1; window shutter, Hanbury Street, E1; coal hole cover, Earls Court. 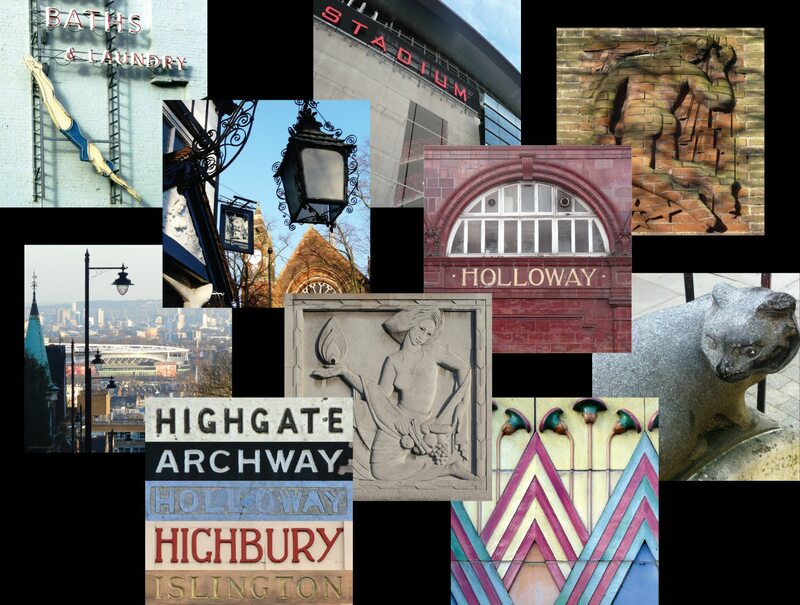 Row 3: Pelican House, Peckham Road, SE5; Ashmount Primary School, Hornsey Lane, N19; The Swan Hotel, Hammersmith, W6; Eagle Terrace, Shepherd's Bush Road, W6; The Swan, Vauxhall Bridge Road, SW1. 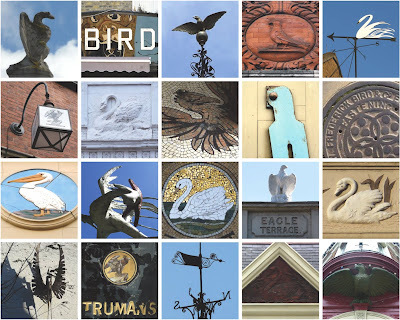 Row 4: Bird sculpture, Stoke Newington Church Street, N16; The Junction Arms (no more), Praed Street, W2; Weathervane, Holloway, N7; The Swan, Gracechurch Street, EC3; The Spread Eagle (now the Jackdaw and Stump), Homerton High Street, E9. In Ireland when we talk about guys we might say; your man and for a woman; your one, this can be further detailed by saying old one or young one. Yer man said this , yer man did that. I hadn't heard of 'your one'. 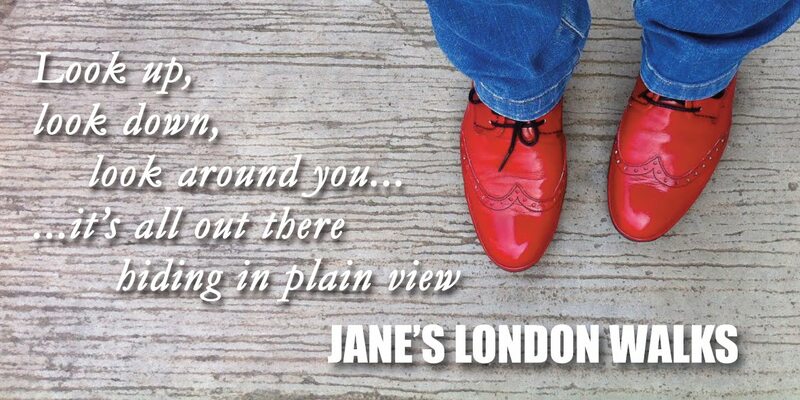 But, when relating an incident to a friend, would you really refer to someone you didn't know, who you noticed in the street or happened to get talking to on the bus, as 'your one'? i.e does 'your one' refer to your friend's female friend? I use "woman" and "lady". They are not the same thing. And I have heard of 'a bit of skirt' - yuck! You me mean personally?! eek!